On 30 January 2012, the 2012 annual meeting of Shibang Company was grandly held in the Eastern seaboard of Green space, Shanghai. The Chairman of SBM, board of directors of our company, board of supervisors, the leaders of management committee, all systems staff representatives and the new staff representatives from the 2012 Campus Recruiting were all present at the 2012 Annual Meeting. After briefly reviewed the 2011 development history of Shibang Company, the Chairman of our company was showing his sufficient affirmation and sincere thanks for the unrimitting efforts of our staff. He said that one modern enterprise which has enough energy, attic faith and powerful creative has already presented for the whole world. So he was thankful for each of his colleagues who was always fighting with him. In the new year, we will also do well in the all-round work, and always put the work that pursuing the staff and clients value maximization in the first place. Then, the Chairman Yang published his own views for the soft power construction of culture, talents and innovations, etc. and our company's hard power manufacturer. Next, he used one original epigraph "Daizy . campaignexpidition" for the end the annual meeting and call on up the company's whole staff to keep up the good work and always work together for our company will be alive after one hundred years. 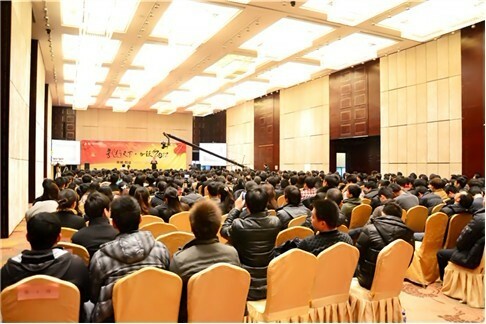 Later, each working centre and department principal went to the stage in succession, used concise and powerful words, fully showed the vigorous development situation of each system in the new year. In the annual meeting scene, our company also made the commendation for the advanced managers and individual who has made the outstanding contribution for our company development in the past year. Since the activity of 2011 company's excellent staff discussion and election, through layer upon layer democracy vote, in the annual meeting scene, we awarded 12 "excellent staff", 3 "advanced manager" and 3 "excellent mananger" altogether. The "Dragon flying in the world·Leaping 2012" art performance which was carefully prepared by our company's staff was unveiled in the afternoon. This annual meeting used large screen live broadcast style to make the performance team and program schedule all reveal vigour and innovation. Song and dance, comic dialogue, opusculum, musical instrument and curtain play, etc, all the program was colorful, the joint performance scene was even one climax after another. For acknowledging our company's staff hard work in the past one year, our company also special reserved a series of heavyweight lucky drawing activity. In this activity, our clients friends who came a long way also involved in it. The spot staff was all enjoying themselves, meantime, they also expressed that they will use their full enthusiasm and empressement to pay back our company and the masses of our clients friends.